I have become a 'collector' of sorts; not of winged creatures nor paper stamps, but of my child's smiles. Their worth is un-quantifiable and their effect undeniably enigmatic, as somehow, despite even the roughest colic-riddled night, one brief grin from her in the morning when I awake seems to pale every frustration in comparison. I fear, I truly would forgive her anything for the price of a single smile. My days literally revolve around my daughter, she has become the Sun to my Earth and I have barely a moment betwixt to do anything other than cater to her whims. I did however find myself with the tiniest slice and relished the chance to visit my lonely kitchen covered in a dust of neglect. I can't tell you how wonderful it felt to be dicing tomatoes and plucking leaves of emerald basil whilst fragments of spring sunshine fell upon my shoulders. And as this recipe only took ten minutes of my time I soon had my little one back in my arms, bestowing upon me more of those precious smiles. cooking time: 15 (I used a storebought base). taste: 4/5. Best margherita I have had. I love pizza. And just like the Teenage Mutant Ninja Turtles my favourite pizza is a cheese pizza (or as we call them down under, Margheritas). 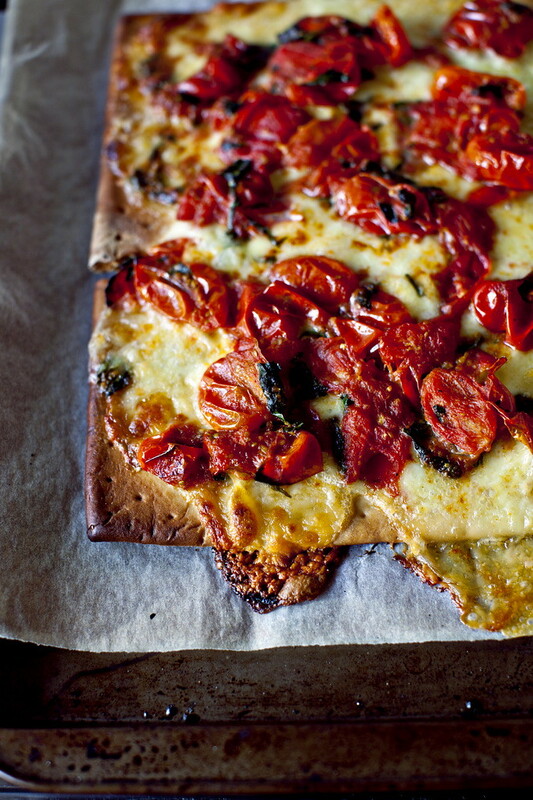 To me, nothing beats cheese and tomatoes with a hint of herb on a bread base. This recipe takes it up a notch. 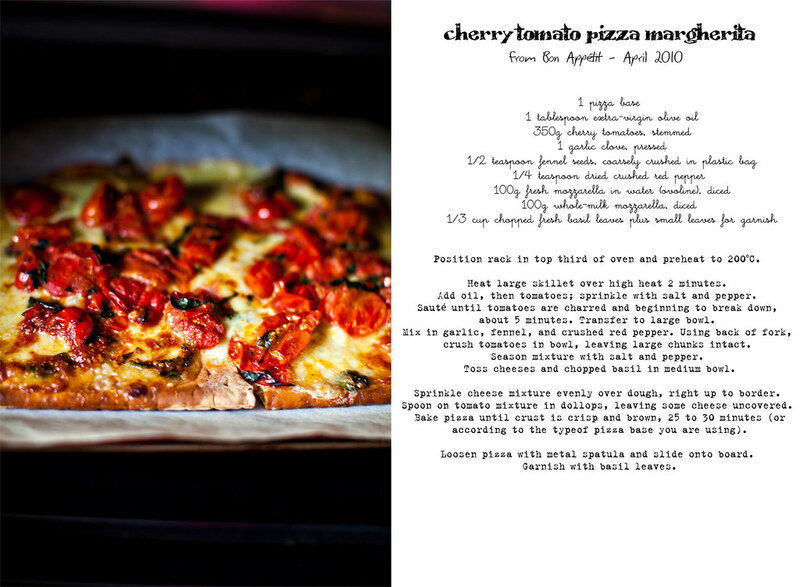 The tart sweetness of the cherry tomatoes and garlic (which I cooked with the tomatoes to soften its bite) works beautifully with the gorgeous aniseed-hit from the fennel seed, fiery chili pepper, fragrant basil and finally the salty, stringy cheese. I served mine atop a gluten-free base (storebought to save time), but I imagine it would be even better on a homemade one. I loved this so much I was death-staring my husband like a hungry dog whilst he was eating his last piece. I only had 250g of cherry tomatoes and it wasn't enough, the recipe calls for 350g which sounds about right. I would double the garlic though. Oh my! That first shot with the melty cheese oozing off the pizza!! Awww it's so sweet how totally enamoured you are with your daughter. You can really feel the love with every word. As for smiles, I know what you mean, my fiance's smile has the same effect on me. As for the margherita pizza, I am SO going to have to try this. Margherita is my absolute favourite pizza, and if it's it the best margherita you've had I have to try it. Aren't daughters fun? I'm so glad my first was a girl! And I'm loving this pizza. Fabulous photos.